Its election time in our Country. I request everyone to administer their voting rights. We would have a black-mark on our index fingers when we vote. But let us not select someone who will end up giving a black mark for the nation. I take this opportunity to talk for Mr. Sharat Babu who is contesting in Chennai Constituency. 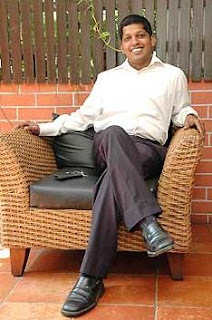 He is a BITS-Pilani, IIM alumnus. His life story is an inspiration for many souls around the Globe [link]. No wonder he is selected as MTV/Pepsi Youth Icon of India. Let us not be political-party fanatics. The country needs individuals like him. There are similar candidates in every state. Please vote for such people. If the readers know of any such similar candidates contesting in different parts of the country, please drop a line about them in the comment box. Let us do a noble deed by spreading news about such individuals.Do it fast because we do not have much time in our hands. Let us strive for a better future. May god bless on us! It's insane how Politics has been completely commercialised. Everywhere we look, we see ads from BJP and Congress trying to beat each other down. I just hope that the citizens of the nation are mature enough to not get swayed by tactics such as this. The country needs better leaders, and fast. Hope the wait isn't too long. Good thoughts dude.. Extremely happy for Sharath.. I hope he wins.. True leaders got be selected for better future..
amisha in politics,kasab claiming to be underage,varun "not so violent" gandhi out..misery sure does come in a bunch. From my constituency I just don't see a right candidate.Might just vote because of the party n not the candidate. politics is a sad state of affairs but then we must exercise our vote, why give up our precious vote for a crook, lets make it a lil difficult for him..
Whooever you vote for, plz don't vote for BJP and it's allied/gonna be allied parties. Communal d*cks. Thanks for putting it up!! yeah ture have to vote sensibly! coming as it does at this time of the year, a post that commands merit Chriz! Thanks! I came across this short article in India Today's issue dated 20/4/09 (Pg no: 56) about a new party floated about a couple of years ago. Bhartiya Punarnirman Dal. Founded by a group of ex-IIT and IIM graduates. They are contesting in about 40 Lok Sabha seats during 2009 general elections. My best wishes are with them. Hope finally some full time politicians emerge from THE premier educational institutes of India. Good work Chriz. People like him make one feel that all is not lost and hopeless in Indian politics. India is a bollywood and cricket crazy country, so nothing surprises me here. Bur we must all support the candidates like Sarat Babu. Barbie Doll on our team...! now we'll definately win! lolz! The news of Amisha aunty contesting had given me an heart attack, almost!!!! That day me a colleague were talking about elections this lady who is contesting from S Mumbai...we know if selected she will do really well but the fact is that will people really votw for her. "Amisha Patel contests for elections" Really ?? one just has 2 vote.period!!! I dont have to explain when I say Navjot Singh Siddhu is contesting from my constituency. Akali-BJP candidate. but he is a good leader as well. the one from Congress isnt as good. If I vote for him, Advani becomes the PM. I dont know who to vote for..
i was totally confused abt whom to vote if i get my voter ID as everyone has some or the other case filed against them...but then, ECI heard my inner voice..so i think i dint get my card..!!! good wishes to Mr. Sharath..!!! I was about to say .... "Vote for Me"
hey Chriz..............thanks for giving that link on Sarath, he is surely an inspiration to so many youngsters!! I'm proud to say that he did his project in Polaris, Chennai for a period of 3 months while he was doing his Masters and i did his joining formalities.Had i known that time he will become so famous....i wud have become his chef!!! i have never voted in my life! and am so lazy to get it done whn am at ma native! OMG where is India heading with it's politics! Sounds so much like SL where actors and actresses join politics just cos they r popular FOR SOMETHING ELSE! I wish people like Sharat win !! and inspire more like them to be a part of politics ! I ll tell you the biggest futuristic outlook statement of the year. Tamizh Comedy actor SS Chandran who has been pitted against Mr.D Maran In the cebntral chennai constituency says , "Amma knows seven languages. She will become PM in the future. And I will request her to give the DEFENCE MINISTRY!" And its sad Chrizji, very very sad to note anyone and evryone from the film industry joining politics. Senseless. Take TN for instance,A campzining by Lakshmi Rai and Simran works magic. Vijayakanth, SarathKumar, karthik and even thalaivar TR (!!) are into politics to rake in moolah. Ah, who cares to serve! We are buffoons or what? Yo!!! Thanks for visiting my blog and hey...you were there yesterday at Qian HU?????? Did you see this girl walking around in a white t-shirt snapping photos and getting everyone to smile?? That's me!! btw Chriz, maybe u can play 'Somewhere over the rainbow' on ur guitar? :) That current version in my blog wud make a lovely song for u to to sing! will vote for sure...is baar 1 voted for the 1st time and vo mark bas last month hi gaya hai...it stays so long.. I would still like a citizen's fundamental right to protest against unfair practices and what not, in an election, by granting us the 'No Vote' option in the electoral process. for now, am forced to cast my vote to the least scandalous one. good that U highlighted the candidacy of sharat..
His story inspired me a lot when I read it some years back/ This guy deserves to win..
Vy the way, this brought my old memories. When i was in LKS, a girl had gt an ink type mark on her finger and claimed to have voted. I came back home telling that even i had to vote. So, my sister took one of the ball pens and put that mark on my finger too. The next day, even i was showing off my finger claiming that i had voted. Gosh! you had to see the look on that girl's face then! Sarath Babu's life is truly inspiring! Good link you have posted! Thanks Chriz bro for writing an article on this!! Thank you for this post and youtube link.